The ukulele is a beautiful instrument, but it’s not as easy to play in the earliest stages (such as a guitar, for example). In this article, we’re going to go over some things you should know about beginner ukuleles and starter ukulele sets. Then, of course, we'll review 10 of the best models we found. What Should You Consider Before Purchasing a Beginner's Ukulele? Beginner’s ukulele models are different when compared to standard models, but you won’t be to notice the difference by eyes alone. Starter sets don’t actually look any different, but they surely are. Beginner ukuleles are intended for people who don’t have any playing skills yet. There will be situations where you simply can’t decide whether a ukulele you’ve set your mind on is right for you or not. Let’s go over what you should consider before making a purchase.First of all, there’s the matter of price – beginner Uke models are usually very inexpensive. Yet, it’s not uncommon that some manufacturers offer high-end ukuleles “packed” in starter bundles. It’s only obvious that these sets come at star-high prices. Secondly, there’s a matter of durability. You can always google the best materials used in Ukulele construction. Most sites advocate that Maple, Rosewood, and Basswood are some of the best. Every material type offers different benefits. Choosing a high quality material should ensure that your ukulele doesn’t fall apart after a couple of months. Lastly, most beginner ukuleles come in sets. You could always buy a solo ukulele and take online or private lessons, but you get everything you need in a single package this way. 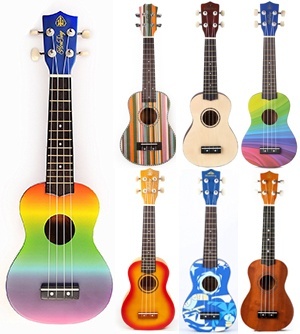 There are also a few ukulele sets available that are very affordable for a ukulele beginner. You might want to take them into consideration if you’re purchasing your very first ukulele. Here we have a beautiful ukulele for beginners – Mahalo’s Starter pack from the rainbow series. 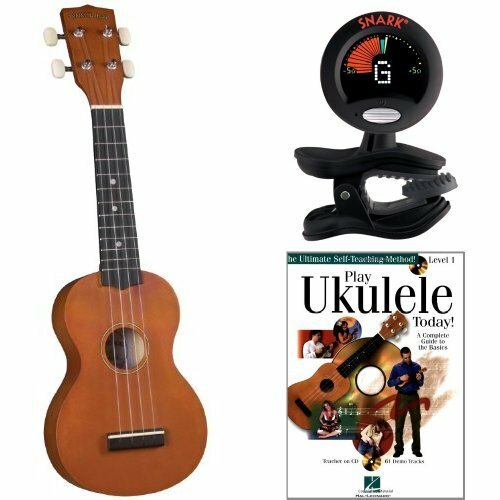 This starter bundle includes a Soprano ukulele, Ukulele digital lessons for beginners, and a carrying bag. The price is very affordable, so this might be your best bet of finding a budget beginners ukulele. About the performance of this ukulele model – it’s outfitted with a special NuBone Bridge saddle that enhances the resonance of bass output. It also comes with a set of Aquila Nylgut high-quality strings, and Gold-Plated machine heads. You can get yours Mahalo Starter pack in various colors – black, blue, brown, green, pink, purple, red, and more. If this is your first ukulele and you don’t have anything to compare the experience with, you can listen to Ukulele Digital lessons that comes included in the bundle. The sound is the same, and the techniques shown are basic and easy to learn. This is a very valuable Ukulele bundle. 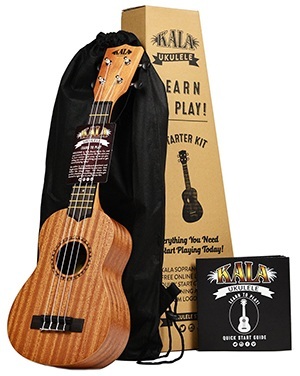 Kala’s Learn to Play Ukulele (LTP-S) starter kit is an amazing beginner Uke set. It comes supplied with everything a beginner needs to start learning the ukulele skills. Learning how to play this magnificent instrument is easy with the Ukulele Playing Guide that comes with the bundle. You’re also offered an option to learn the basic skills of ukulele with Free Lessons found online. The tuning application is also a great addition for beginners. Most people don’t know how to tune their instruments at the earliest stages, and this app makes it easy. However, you need to know what the standard tuning for ukulele is. In case you’ve missed in the beginner’s guide, it’s “Standard G Ukulele Tuning”, and you need to tune your strings in the following order – g, C, E, and A, respectively. Honsing's Soprano Ukulele is one of the best-looking beginners Uke models on the market. It has a vibrant HS & Rainbow stripes design that looks relaxing and comforting. Knowing that native Hawaiians made ukulele playing famous, the manufacturers found it fitting that they honor the tradition with this beautiful body ornamentation. This brand is famous for various ukulele products, and this series includes Honsing's Soprano Uke Basswood Original and Sunburst models. Both of these ukuleles have similar configuration settings as Honsing’s Ukulele Rainbow Stripes. The strings featured on this ukulele model are improved when compared to the earlier models. They sound better and they are more durable. This ukulele is crafted of Basswood, both on the top, and the sides. With 21” in size, 12 frets, and premium-quality strings, this is considered to be a “standard beginners ukulele”. The price is not cheap, but it’s definitely not overly expensive for a beginner model. High value for the price. 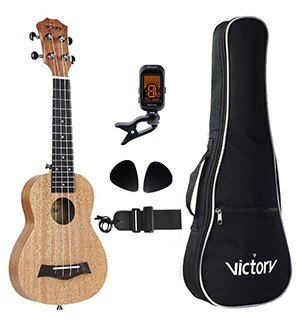 Vi Victory Soprano Uke beginner kit might be the best beginner Uke bundle that money can buy. It, however, costs a bit more when compared to most beginner models. We can guarantee though that the quality of sound and material of this ukulele are unprecedented and undisputed. The fingerboard and bridge of this soprano ukulele are made of triple-A Indonesian Rosewood. The top, neck, back, and the sides are constructed of triple-A Mahogany. These materials provide a beautiful outward appearance and a durable construction. This ukulele model comes strung with superior-quality Italian Aquila strings. 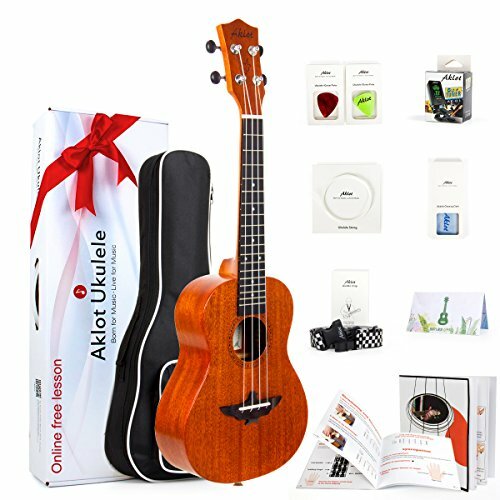 This beginner uke bundle is a 5-in-1 kit that includes the Ukulele standard Gig bag, ukulele straps, ukulele picks, and the Cherub Tuner. This kit, however, doesn’t include a beginner’s manual or guide, so you’ll have to look online for tuning models that would comply with what you want to play. (a reminder, standard ukulele tuning is “G standard” – g, C, E, and A, in that order). 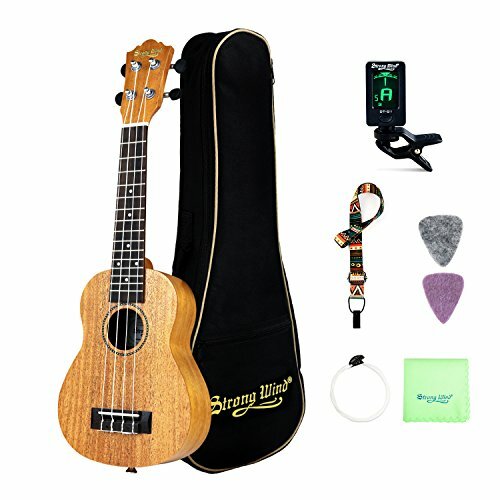 If you are a Uke beginner who’s looking for his first instrument, we strongly recommend that you consider Strong Wind Soprano Ukulele. It’s very affordable, quite durable, and it’s specifically made for people who are new to this form of music playing. This model features a standard Ukulele design – 21” in length and four nylon strings. The body and neck is made from mahogany wood. A high-gloss finishing touch was applied on the structure so that the surface looks even more beautiful and reflective. The body of this ukulele is quite thin – this means that the sound can “get out” much easier, making it clearer and more melodious. This ukulele is definitely worth considering, even if we don’t take the price into consideration. Diamond Head’s DU-150 Ukulele set features all you need to get started the moment you get it. 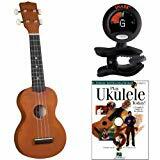 It includes the DU-150 Ukulele, a Soft Case, a Snark SN6 clip-on tuner, a set of four strings, and “Play Ukulele Today” instruction guide with DVD from Hal Leonard. The shape and design of Diamond Head’s DU-150 are plain and straightforward. This ukulele model resembles most “standard” straight-wood models, but it’s more capable than most. The body and neck of this magnificent ukulele are made of maple with a high-gloss finishing touch. The nickel-plated tuners come with white buttons that are exceptionally easy to use. The importance of easy tuning is best seen when compared to budget tuning mechanisms. Some ukuleles tend to get out of tune when they’re supplied with these. Anyhow, Diamond Head’s DU-150 Ukulele holds a great value for the cash, even though it’s quite expensive for a beginner Uke. This is another amazing ukulele starter set from Strong Wind. It comes with all the basic gadgets and helpful items you need to starting practicing this beautiful instrument. 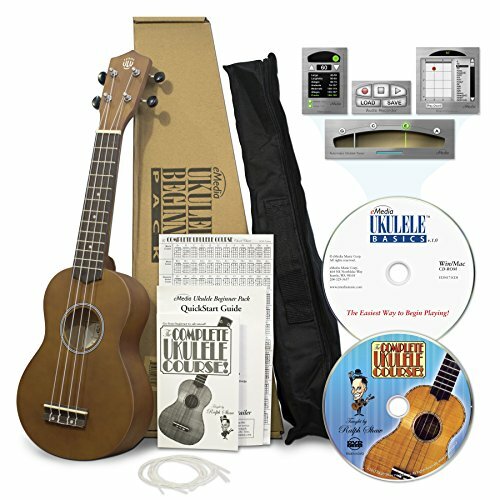 Even though this is a starter bundle, it’s not only for kids – the 23” Concert Uke beginner package is also good for adults. Strong Wind’s Concert Ukulele is made of mahogany. The thin body of this ukulele is responsible for improved sound clarity and depth, and the nylon strings are there to make your playing experience complete. The larger size of the concert ukulele provides more resonance than the smaller soprano size. 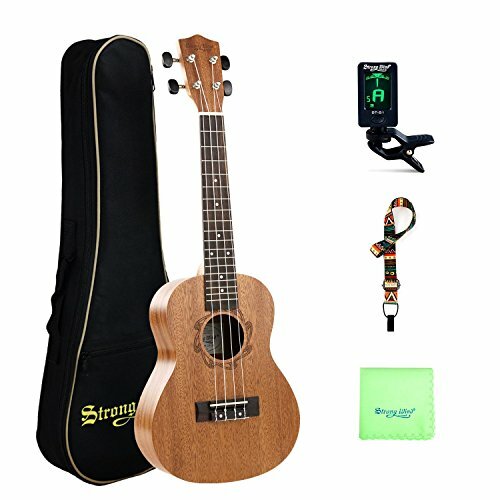 This beginner Uke set comes with a gig bag, a polishing cloth, a tuner, and a set of four Aquila nylon strings. Strong Wind’s 21” concert ukulele is pretty sturdy, it’s fun to play, and has good value for the money. If you don’t own a ukulele yet, you might want to consider this bundle. Here we have a beginner’s ukulele kit by eMedia. This is a reputable brand in the music industry, made famous by their music bundles, playing instruments “for dummies”, and more. This ukulele is made of linden wood for the body and has a birch neck. The ukulele itself is very durable, but it’s not as attractive as some models we’ve mentioned so far. If you’ve never played ukulele and want to get started right away, eMedia also provides you with a Ukulele lesson DVD where the Ukulele King Ralph Shaw teaches you the basics. The lessons cover the grounds of tuning, the basic chords, the strumming, the ornament notes, playing in 4/4 and 3/4, and more. The full bundle includes a Nylon Uke bag, a set of extra strings, a printed chord chart, and the instructional booklet. In addition, some software tools (metronome, tuner, recorder) are included with the package. This Ukulele set is somewhat more expensive when compared to the average bundle, but it’s worth the extra cash. 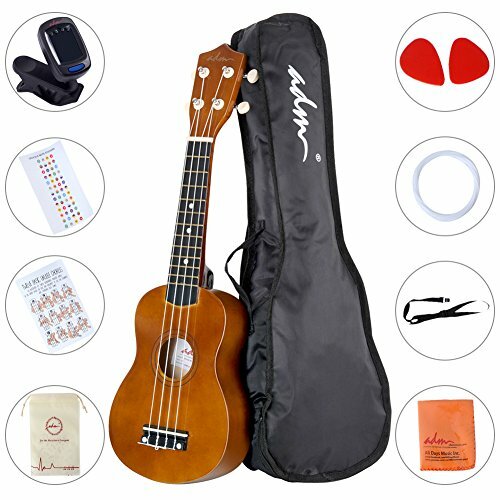 ADM’s Soprano Uke beginner bundle is one of the most affordable Ukulele packs we’ve come across. This model is mocha, but ADM offers Ukuleles from this series in brown, blue, black, pink, and purple colors. A standard basswood construction was applied for optimal durability, along with chrome-plated tuners that come with small plastic buttons. Every Ukulele from this series features a length of 21”, twelve brass frets (fret position marks 5, 7, and 10), and basswood construction. This Ukulele bundle includes a gig bag, an ukulele strap, a set of extra strings, two ukulele picks, chord chart, a polishing cloth, and the digital tuner. The 23" concert ukulele from Aklot is made from mahogany and comes with a gig bag, extra strings, strap, picks and a clip-on tuner. In addition to an instructional guide, the kit comes with links to online instructional materials as well. The instrument itself has a nice look to it overall and has a pleasing color. Interested in this ukulele? Check this very helpful video below which gives you a demo of the ukulele and some feedback on the instrument. The best beginner Uke is usually one that’s simple in design and doesn't break the bank. If you happen to like this instrument, the first model you buy usually won’t be the last. This is why it is important to get a budget ukulele as a first instrument, but it’s also important that it’s at least somewhat durable so it will last you through your beginner months and years.